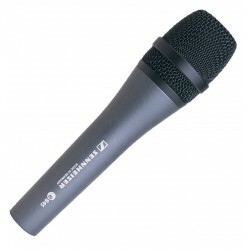 Dynamic Cardiod Vocal Microphone The ND76 is a robust, high-performance, large-diaphragm dynami.. Dynamic Supercardioid Vocal Microphone The ND86 is a robust, high-performance, large-diaphrag.. Dynamic Supercardioid Vocal Microphone The ND96 is a robust, high-performance, large-diaphragm ..
Entry-level Dynamic Vocal Microphone The PL24 is a professional-grade supercardioid dynamic v..
Sennheiser Microphone e609 Rugged workhorse with a practical shape. The super-cardioid e609..
Overview Extended high frequency response and supercardioid pick-up pattern for higher ..
Sennheiser Microphone e906 The Sennheiser e906 captures the guitar sound just as you want it to b..